I first met Tommy when we both ran in the handicap mile at Singer’s Sports about 1960 – I was third and he was well in front after starting well behind me. He was very friendly and we got on well but, as I was to find out later, Tommy got on well with everybody. Despite being Scottish steeplechase champion and the first ever SAAA record holder for the steeplechase, he had no hidden agenda and was consequently respected and liked by everybody. He raced on the track, on the road, over the country and on the hills with success; he competed in events from 800m to marathon, from short hill races like the one at Campsie Glen and fearsome ones like the Ben Nevis. He is a member of Springburn Harriers and has represented the club in County, District and National Championships and in the prestigious Edinburgh to Glasgow relay. Occupation: Coppersmith, John Browns; Coppersmith/NDT Foreman, Rolls Royce. Now retired. How did you get involved in the sport? I had run in a sea cadets sports day and was first in one race and second in another. This led me to think I was God’s gift to athletics. After joining Springburn Harriers I thankfully soon realised I was not as good as I thought I was! Has any individual or group had a marked effect on either your attitude to the sport or to individual performances? I think I was thankfully influenced in my early years by the conduct, attitude and dedication of the committee members and the running members of Springburn. What exactly do you get out of the sport? The satisfaction in my modest achievements, the feeling of well-being you have when you are fit and running well, and last but by no means least, the friendships that I have made over the years which have lasted a lifetime. Can you describe your general attitude to the sport? In my early years it was a quest for fitness and improvement of performances, but now it’s just be as fit as you can be. And enjoy your daydreams and memories of yesteryear, but when that man fires the gun, if you are not fast, you are last, so just go! What do you consider your best performance/performances? Obviously my two steeplechase championships and the two Scottish records, something I never thought possible, but I think that the third team place in the 1964 Midlands cross-country relays, where I was undoubtedly the weak man in the team, and was expected to lose places on the third leg but the ability to hurdle barbed wire fences (four in the last half mile) was a great asset to have and so it proved – I held on to third place on the day. What ambitions do you have that remain unfulfilled? To be picked for the Olympics and to win the lottery! But to be serious, idf I can get a bit of fitness and get on to the track again, I will be happy. What do you do apart from running to relax? I enjoy a day in the hills up north, and I also still have a few sections of the West Highland Way to do. What did running bring you that you would have wanted not to miss? Discipline, achieving something in the sport, goals to aim for friendships and wonderful memories. What do you consider your best races? Both my Scottish championships and the third place in the cross-country relay. … and your worst? My worst race for various reasons was the Scottish Three Island Peaks Race in May 1986. The race started in Oban at 2:30 pm on the Friday and the first leg is a short sharp run up round McCaig’s Folly then back down into Oban for the sail to Mull where we had to run Ben More (3,169 feet), down to Jura to run the three Bens of Jura and then round to Arran to run Goatfell and finally to finish in Troon on the Monday. What was to follow during the race I can only put down to the fact that I had run in the Lochaber Marathon the previous Saturday (winning the Over 50’s age group) and not giving myself a chance to recover. We came off Ben More just as it was getting dark with about seven and a half miles of road still to run. With four miles to go I was in a dark place, I had said to Dave McKirdy that I had nothing left to give. Without a word, he took my pack off and put it on along with his own and then said, “You can run now”. I was able to jog the remaining miles to Salen and the yacht. That was Davie at his best. Can you give some details of your training? My training was never that scientific. I had always enjoyed running hills so I based my training on hill sessions with the occasional long runs – and at times they developed into hill sessions. As he said above, Tom had been a runner for Springburn from 1951. In 1952 as a Junior runner he was forty ninth in the National and he would go on representing the club in major competitions right up until 1977. If we start there at the beginning of 1952, the first race that was reported in the ‘Scots Athlete’ was the Midland District Championship on 2nd February where Springburn Harriers was third team with Tommy being a non-counting runner in fifty second place. In the National a few weeks later he finished 49th in the Junior Championships. He was still a first year Junior in 1952. By 4th October though, he was a member of the first team which finished eighth in the McAndrew Relays. Tom was on the second leg and the team was S McFadyen (16:30), T O’Reilly (16:38), T Lambert (16:08 and J Stevenson (16:55). A month later, on 1st November, he was again in the club’s first team which unfortunately finished thirteenth with the team this time being K Rankin (14:22), T O’Reilly (14:29), S McFadyen (14:24) and J Stevenson (14:02). The teams were well matched with the runners all having very similar times. In November came his first taste of the Edinburgh to Glasgow and the picture above, by George Barber, is taken from the front of the ‘Scots Athlete’: the stage winner was George White of Clydesdale (number B 4) with Tommy back in fourteenth place. He was to run on every stage of this magnificent race before he was done with it in 1977. The Inter-Counties was held on December 13th that year and Tommy O’Reilly was selected for the Lanarkshire team and finished twentieth. Into January and the Midlands Championship was held at Lenzie where Springburn Harriers finished fifth with Tommy 61st. On 28th February in the National, Tommy was still a Junior and had a disappointing run to finish in 53rd. He did not appear in any track rankings of championship reports that summer but in November he turned out in the Midland Relay at Stepps and ran second in the team that finished seventh. The runners were S McFadyen (15:21), T O’Reilly (15:22), A Stevenson (15:28) and Tommy Tracey 13:56. The arrival of Tommy Tracey was to help the club to several trophies and medals – but so was the maturing of Tom O’Reilly. In the Edinburgh to Glasgow Relay later in November, he was on Stage Four and moved the team from tenth to eighth (it was to finish fourth) with the fourth fastest time of the day on his stage. In February 1954 Springburn was third in the Midland Championship with Tommy 28th. The National in 1954 was his first as a Senior but the trail at Hamilton was familiar to him by now and he finished 57th in a field of over 200. In November 1954 he ran the first stage of the Midlands Relay where the team of O’Reilly (17:16), DG MacKay (17:43), RF McLean (17:10) and T Tracey (16:46) finished fourth and just out of the medals. In the 1954 Edinburgh to Glasgow he again ran the fourth stage and again made up ground (fourth up to third) with fifth fastest time on the leg to help his club win bronze medals for third place. In the Midland Championship on 29th January at Lenzie the team was again third and Tommy was 37th finisher. Springburn only dropped to fifth in the National but Tommy O’Reilly was twenty fifth and the first man from the club across the finishing line. Later that year he joined the RAF to do his National Service and although it took him out club teams for the following winter – he even missed the E to G – it improved him as a runner. When you see that a runner was in the RAF, you immediately think of all the very good Scots who have run for the service with distinction. Men like Joe McGhee, Alastair Wood and steeplechaser Gordon Rimmer all come to mind as do the many non-Scots like Derek Ibbotson, Steve Jones, Roger Hackney and Julian Goater. When the RAF officer asked the new intake if they were interested in sport, Tommy responded immediately with athletics. He won the trial with some ease – three two mile laps saw him go to the front at the start of the second and win on his own. The sergeant in charge of the team was Sergeant Bill McMinnis who had won the Doncaster to Sheffield Marathon in 2:33 in 1954 and was an established English and British International. When Tommy won the race the following week, which McMinnis missed because he was running for Britain in Czechoslovakia, in a time faster than McMinnis’s course record, notice was taken and Tom and Bill became firm friends. It was a friendship that lasted well beyond their time in the services. Tommy was then posted to a station where the top man in the athletics team was a chap called Danny Gallagher who had been a professional in Scotland and was also a very talented runner. Many friendships forged in the Services lasted and Danny became another of Tommy’s long lasting friends. Fate also plays a part in the development of any running career. Tommy was charged with setting out a trail for an RAF championship and he chose one which just by chance suited his knowledge of the local terrain and his talents. When it was heard that McMinnis himself was coming to run, all Tommy’s RAF friends came along to see him getting a right good doing by the great McMinnis! Tommy won. Then several weks later he had a letter from McMinnis saying that he (McMinnis) had been selected for the RAF team but had declined saying that they should pick Tommy. They did so and Tommy gained his RAF vest. He was also approached by Derek Ibbotson to request a transfer to Ibbotson’s squad but turned it down for personal reasons. Tommy pointed out that when he was ranked twelfth in Britain for the steeplechase, there was a note at the foot of the list saying “a noteworthy performance” and it was Ibbotson who had run a steeplechase twenty seconds slower than Tommy had done but there had been one hurdle missing in each lap. The time in the RAF clearly suited Tommy. The regular hours, time for training, companionship and structures competition led to an improvement in his performances – his first Edinburgh to Glasgow when he returned to Civvy Street produced the second fastest time on the eighth leg. Having missed the whole of the Scottish 1955-56 winter season serving Queen and Country, Tommy started the following season in the traditional opener, the McAndrew Relay on the first stage in a team of O’Reilly, Rooney, McCormick and Ballantyne which finished fourth. In the Midland District Relay at Stepps on 3rd November, Tommy ran first in the team which again finished fourth with Rooney, McCormick and Tracey as his team mates. As noted above, he was on Stage Eight of the E-G two weeks later and ran a very good race to be second fastest in the field. The heavy, hilly trail at Hamilton was not to his liking in 1957 and he finished outside the first 100 – 109th – in the team that was eighth. He continued his adjustment back to civilian life that summer but one item in the report on the SAAA Championships in June that year in which an RAF man excelled is of interest. “D Shaw (RAF) followed the holder FG Nelson (bellahouston Harriers) for a few laps in the steeplechase but then went ahead and won in the new best championship time of 9 min 22 sec beating Nelson by 35 yards. The former champion was also inside the previous best time.” The steeplechase championship race was run over 3000m for only the third time, previously held over Two Miles there was no Scottish record, native, national or all-comers record on the books. There was of course the slight problem that there was only one track equipped with a water jump in Scotland and, since that was in Edinburgh, training for the event and encouraging runners to take it up were both difficult. The winter of 1957-58 had the Edinburgh to Glasgow run on the third Saturday in November and Tommy took his place back on the first stage where he was ninth for a team that finished sixth and in the other major event of the year, he was seventy fourth. At this point he was doing good club standard running but things were to change that summer, and again an element of chance was present. The SAAA Championship entry forms came out and beside each event there was a time, height or distance in brackets. These were the ‘standard performances’ and athletes achieving or bettering these marks received a standard medal. This was the Association’s way of encouraging athletes to improve – and it might well be an idea whose time has come around again in 2012! Tommy went through all these times and decided he would have a very good chance of getting a medal in the steeplechase. He was a good runner and he could hurdle. On the day he knew that Clark Wallace of Shettleston was probably the best in the field so he latched on to him. After a couple of laps he looked back and saw that they were well clear of the third runner and felt that he was on for a silver medal. Then it dawned on him that he could maybe win it and at the gun he took off. And won. The second RAF man to win the event in two years. The standard was only 10 minutes 10 seconds and his time of 9:41.2 meant that he had his standard – but he also had gold! Although he was good on all surfaces, he still regards himself as primarily a track runner and that showed up again the following year. Like all runners in all clubs, he raced all summer – roads, track events at sports meetings, highland games and championships. He set his personal best for the one mile in summer 1959 when he ran 4:23.8. One typical race that year was a short-limit handicap at Carluke where the race report read: “The principal event at Carluke Rovers open sports meeting was the invitation one mile short limit handicap in which the Scottish record holder G Stark (Edinburgh Southern Harriers) was running from scratch. At the end of the first lap, Stark was just behind R McKay (Motherwell YMCA) and J More (Kilmarnock) who started from 10 and 15 yards respectively. In the meantime however, the Scottish steeplechase champion, T O’Reilly, off 35 yards, was setting a good pace over the seven lap course and by half distance it did not look like Stark would catch the leaders. Soon afterwards, McKay and More left Stark and he had to be content with sixth place – 6.2 seconds behind O’Reilly the winner.” A seven lap one mile race on grass: to get an idea of how tight it was, think that indoor tracks at present are four laps to the mile! This race however was in August and in July Tommy had already won his second SAAA steeplechase title. John Linaker was the fastest in Scotland at the time and another in the race who had beaten Tommy frequently in the past had been J More (Kilmarnock): not matter how Tommy ran the race, More would come past with a rush up the finishing straight. Tommy O’Reilly was thought to be looking forward to third place. But never the man to give in before the race was run, he simply took off when the starting gun fired. He just ran away from the rest. And won again. The first to congratulate him after the race was More who had finished about 350 yards back. He said that Tommy had taken ten yards out of him at every hurdle and water-jump. 30 obstacles made that about 300 yards so it was probably an accurate enough calculation. The even better news though was that the SAAA had decided to keep records for the event and so the first ever Scottish record holder for the event was Tommy with his time of 9:12.2. It was covered in the ‘Glasgow Herald’ as follows: In the senior events best championship performances were established in the 440 yards, 3000m steeplechase and pole vault.” Not a lot of coverage there, then. The results further down the page noted that he had won in 9:12.2 with JH Lineker second and R Renton third. The record stood for six years until Lachie Stewart broke it on 12th August 1965. When asked about his steeplechasing ability at a time when there was still only one water-jump in the country, he said that he was never the best runner, but he could hurdle. He says he can’t boast about it because he had nothing to do with it – it was just an ability that he had. And maybe even one that he developed, he certainly had no fear of hurdling cross-country fences, walls of hedges as we will see when we come to the 1962 cross-country season. He was also not slow on the flat – see the report on the race above at Carluke and it was also in 1959 that he was invited into a race at Ibrox against his old RAF colleague Derek Ibbotson, England’s Frank Salvat and Scotland’s Graham Everett. Times can be deceptive, especially when we are talking about the 1950’s when they were run on cinder and grass tracks. Both were seriously affected by the weather unless they were well-drained and very few were. Many were not even level! What can’t be tinkered with is a man’s competitive record and Tommy was a very good head-to-head racer on the road and especially on the track. If we look at his Edinburgh to Glasgow record we get a table like this. Several points emerge: (1) He is one of the very few men to run all eight stages for his club in this event. (2) Leaving aside the last run, he had a net gain of 4 places and only lost 2. (3) The last run ins atypical and to me represents a desperate ploy by his club at a time in his career when he should not have been looking at this difficult stage: but it is a mark of his team spirit that he agreed, probably reluctantly, to do what his club required of him. The club though had been very good indeed throughout the 1960’s on road and country with several outstanding track men and that has been noted elsewhere on this website and Tommy contributed to this success. Since he is regarded by many as being primarily a steeplechaser we should look at his career in that event. We have already noted his two SAAA titles and his record but he went on to win more medals in the event at National level. He continued to run well on the track and won bronze in the SAAA steeplechase in 1960, 1961 and 1963. In 1961 John Linaker won from RA Henderson of Braidurn AAC with Tommy third. 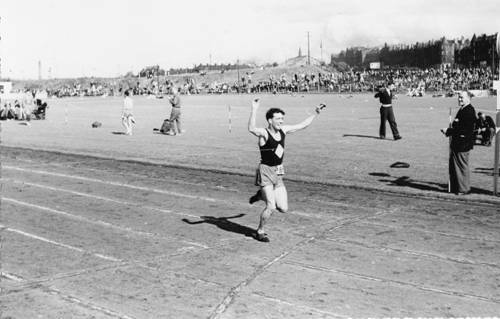 The report said, “JH Linaker, who is English born, had a splendid run in the steeplechase easily outstripping his rivals, who included JP O’Reilly (Springburn) whose previous best time he beat by nine seconds.” Interestingly enough, Tommy’s team mate Eddie Sinclair won the Three Miles from Alastair Wood in 14:05. Tommy’s best time for the steeplechase that year was 9:31.6. In 1961, he was again third behind Linaker (again) in 9:26.6 and A Ross (Edinburgh Southern). His best that year was 9:42.6. Unplaced in 1962, he had better luck in 1963 when he was second behind John Linaker (timed at 9:24.6) and in front of HD Brown (Anglo-Scottish). This ended a period when he won five SAAA Championship medals in six years – two gold, one silver and two bronze. But there’s more: as has been said, there was no water-jump in the West and so the event did not appear in the District Championships until 1961 when there was one at Westerlands. Then in 1971 when the West District Championships went to Carluke for two years, there was again no ‘chase in the District event! In between times Tommy did well in the District Championships. He had been third in the Mile in 1959; in 1960 when there was no event in the West John Linaker won the equivalent race in teh East Championships in 9:10.4. In 1961 Colin was second behind Charlie Meldrum and one place ahead of fellow Springburn man Moir Logie to take the silver medal. He went one better the following year when he won from Lachie Stewart and Jim Finn in 9:53.8, and in 1963 he was second to John Linaker and ahead of Lachie Stewart at Dam Park in Ayr to take silver. Linaker’s winning time was 9:25.8. 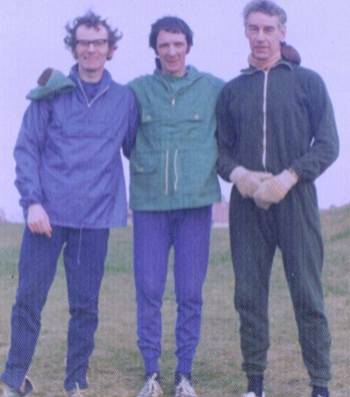 In 1967 a new generation of steeplechase runners appeared and in the West District Championships on 29th May, he was third behind Joe Reilly and Tom Patterson with the winning time being 9:57.4. He won one more medal at the District Championships and that was in 1969 when he was third behind Hugh Elder and Jim Sorbie in a time of 10:05. In 1970 they went to Carluke and there was no steeplechase. Although he was a good runner over the shorter cross-country races, it’s probably fair to say that it was never his favourite surface. That he could run well in the relays at the start of the season is illustrated by the story if the Midland Relays in 1969. The ‘young lions’ such as Harry Gorman, Duncan Middleton and especially Eddie Knox were starting to come through as outstanding seniors. In the trial for the team to represent the club in the Midland Championship, Mike Bradley (SAAA’s and AAA’s champion miler and Scottish international runner), Harry Gorman (a very good club runner indeed) and Eddie Knox (Scottish track champion in several age groups and world junior cross-country champion) all moved away in a group at the start. Tommt was intent on following them but was running on his own just a bit back from them but clear of the rest of the field, so they encouraged him to run with them for a bit before he dropped back a bit at the finish. However he was clearly in the team and not as sharp at that point as the others. The running order selected was Harry Gorman first, Mike Bradley second, Tom third and Eddie Knox last. As I said, Harry was a very good athlete but at that point in his career he could be a bit erratic and the Midland Relay was a day when he finished down the field n twenty first place. Mike ran a first-rate second stage to pull in no fewer than eighteen places and hand over to Tommy. The thinking at the time of selection was that the first two would get a good place and if Tommy could hold it or limit the drop, then Eddie could have a real go on the last part of the race. Tommy took over in third and held it for a bit but was being overhauled when they came into the last half mile. There was a fence. He cleared it and as he landed turned and saw the next three or four guys climbing over and passing him – but there were three more fences in that last half mile and he took no prisoners at all at any of them, regaining third place and giving Eddie a lead of just a couple of feet from the fourth runner. Eddie ensured a safe third place and bronze medal for the team. A good run from a very competitive athlete and team man. The fences might have helped, but his attitude and track speed were maybe also key factors. Shortly after Tom became a veteran athlete, he answered a questionnaire set by Hugh Barrow in 1981 and that is printed below. Personal Bests (including your best veteran performances): 220 yards: 24 seconds; 440 yards: 53 seconds; 880 yards: 2:00; Mile: 4:22; Two Miles: 9:18; 3000 steeplechase: 9:12.2; As a Vet: 200 metres: 25.5; 400 metres: 56.5; 3000 flat: 8:52. How did you originally start in athletics In my early teens I was a member of a sea cadet company and ran in the Glasgow cadet championships with some success. On ;leaving the cadets and looking for another interest I joined Springburn Harriers on 1st August 1951. What do you consider to have been (a) your best performance? 3000m steeplechase in 9:12.2. (b) Your worst performance? Scottish Three Island Peaks race – 3 days 20 hours. What are your goals as a veteran? To compete as long as I am able, and let people see that life can begin at 40 and extend the band of friendship that is so much part of Vets athletics. Give details of your training: Over the past few years, like a lot of the Vets, I have had my share of injuries: when the injury clears I build up my fitness on steady running. When a level of fitness is reached where I can start to think of hill sessions or whatever , I seem to be injured again, and so it goes on. What do you do to relax? Long easy runs, a glass of homemade wine with friends, a cider or two after a race, hill walking. Where do you think veteran athletics goes from here? Veteran athletics have come a long way in the past years, and are still moving forward, but we must never lose the sight of the simplicity of its original aims. Where we are not organised is at club level. I know East Kilbride have started out along this road and I hope my club will follow their lead shortly. This is not meant as a reflection on the clubs but on the individual Vets, myself included. TP O’Reilly enjoyed a long and successful career as a veteran runner. Turning 40 in 1972 (vets athletics started at the age of 40 in the late 1960’s and the M35 category did not come into being until the twenty first century). One of his first big triumphs was in 1973 when Bill Ramage, who was an enthusiastic competitor in vets athletics, asked him if he’d like to compete in the English Veterans Cross-country championships at Birmingham. Tommy was a bit doubtful but agreed and they persuaded Tony White to complete the three-man team. Tony came from Birmingham and insisted that they stay with his family there. They did stay there in comfortable surroundings, had a good night’s sleep and then competed. Bill was eleventh, Tom was twenty third and they had a wait until Tony crossed the line in fifty third . Looking over the scorers shoulders Bill and Tom thought that they were second team but said nothing, convinced that they were mistaken. But they weren’t – second team in the English National. Tony’s first big medal and he was straight off to phone home about it. The picture above was taken at the course after the race. In the Scottish Veterans Cross-Country Championships, he won eleven individual medals in the M40, M50, M60, M65 and M70 age-groups including four victories: M60 in 1996 and 1997 and M65 in 2000 and 2002. His last two medals, in 2004 and 2006, were both silver in the M70 category. But he ran in more than cross-country championships, and as an M70 vet in 2004 he won the Coatbridge 5K in 22:27, the Christmas Handicap 5 Miles in 35:44, the Scottish Veterans Walter Ross 10K at Lochinch in 45:04, the Scottish Veterans Glasgow 800 10K in 48:23 and the Alistair McInnes Memorial 5 Miles in 35:31. His best track times in the twenty first century so far are 2:57.46 for 800m in 2006 which won the Scottish Masters Championship and 5:58.94 for 1500 indoors in 2006. As an M80, I wouldn’t be surprised to see him have another go on the track soon!